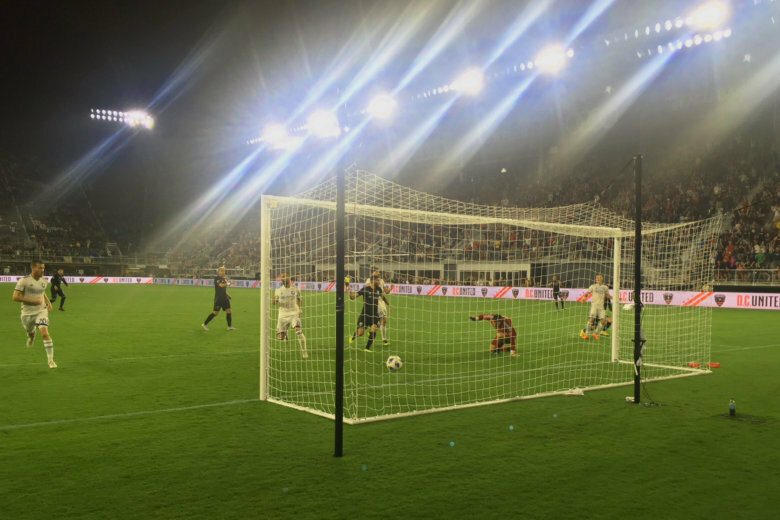 Nearly a month after its grand opening, Audi Field played host to something of a fan's opening day Sunday night, when Wayne Rooney helped deliver one of the great wins in franchise history. Sure, pigs could fly, hell might freeze over, and D.C. United could still make the playoffs this year. But after watching Wayne Rooney scamper 50 yards to make an impeccable tackle, dribble back up the field far enough to send an impossibly placed lob to the head of Luciano Acosta, the shortest man in the game, and for the ball to find the back of the net to earn the most important three points in recent D.C. United history, via a 3-2 win over Orlando City at the absolute death of stoppage time? Well, it’s enough to make you reconsider some things. Take, for instance, the entire narrative around the stadium itself. Opening Day at Audi Field came nearly a month ago, July 14; and while it ushered in a new era for D.C. United, it also brought a series of unresolved issues. Lapsed communication and an escalation of rhetoric led to a standoff between the front office and two of its supporters groups that led to them protesting the opener. Fans had issues with electronic tickets and the new clear bag policy. About the only thing that went unequivocally right was the game itself, a big 3-1 win over Vancouver that included Wayne Rooney’s debut, albeit off the bench. Sunday night’s affair might as well have been billed Fans’ Opening Day. With all three supporters groups officially represented in the stadium for the first time, afternoon thunderstorms and a late, weeknight start drove away any kind of walk-up crowd. There was, perhaps, slightly more than half of the 17,020 announced paid attendance actually in their seats, and yet there was more crowd noise than at the packed opener. Gone was the over-the-top hype man, the over-pumped public address system, the corporate pomp and circumstance. D.C. Washington sang the anthem — his first at Audi Field — in his crisp, distinctive way that has become a blanket of comfort and familiarity around District sporting events. The supporters groups unfurled tifo that read “No Hate — We’re Better United.” While it could have been read to be referencing the apparent resolution to the discord and strife between the front office and its supporters groups, it was actually intended as a broader message regarding the geopolitical events unfolding in Washington Sunday. Nevertheless, it was a fitting message for the fans within the stadium as well. According to some supporters, the supporters section was somewhat disorganized, but that wasn’t really evident from afar. Chants caught on around the stands as the game wore thin and more desperate. There was a real sense of urgency and excitement that the July 14 opener lacked. The crowd had the reckless abandon feel to it that made RFK what it was, accentuated by the self-selecting nature of the weather. “This is just awesome, because we love to show up and put it on in the rain,” said Carrick Baugh of District Ultras. By the end, there was more beer falling from the sky than raindrops. We always knew D.C. United was going to be looking up the table at the rest of the league by midsummer, with a road-heavy start and a frantic, backloaded schedule. The team came into Sunday’s game with just 18 points in 19 games played. Even accounting for the three-to-five games in hand that they have on the rest of the conference, their current pace would leave them well short of the playoffs. Even with Sunday night’s win, they are nine points back of sixth-place Montreal (albeit with five more games to play than the Impact). In short, they need every point they can get. Playing an Orlando City team that is on the outside of the playoff picture themselves, this was absolutely a must-win kind of game. That became all the more the case after Orlando’s Cristian Higuita was sent off with a red card for elbowing Yamil Asad in the 55th minute, a controversial call that only came on video replay. The Black and Red had let a 1-0 halftime lead slip, but pushed ahead — again after video review — on Acosta’s second goal in the 64th minute, only to give up a second bad goal to tie the game again in the 71st minute. It remained 2-2 into the dying breaths of stoppage time, when Rooney took the game into his own hands and delivered one of the great wins in franchise history. It was just one play, one game, one night of chanting and celebrating the way so many fans have dreamed of for so many years.